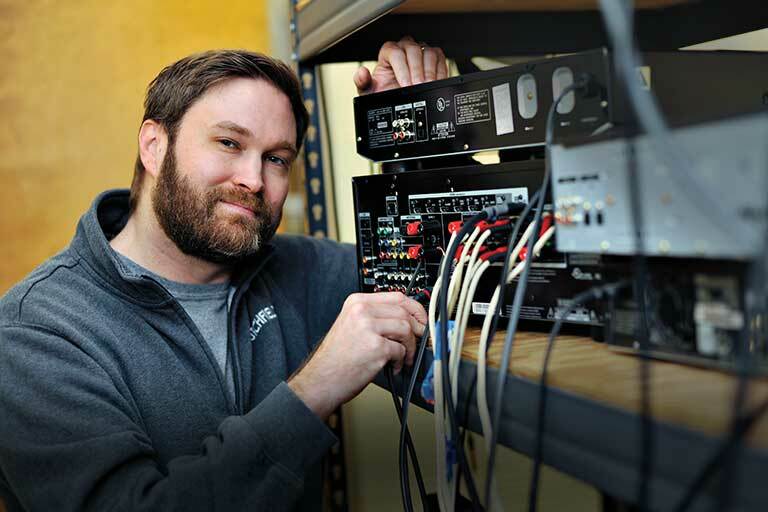 JBL's adjustable InvisiBall® mounting system lets you make a permanent, but flexible installation. If you need some speakers for background music and customer paging, why not choose one that looks good as well? 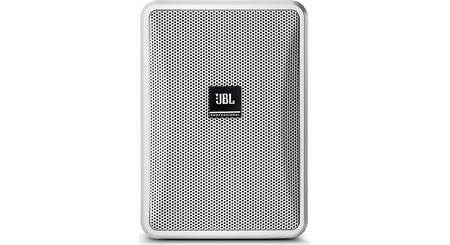 The compact JBL Control 23-1 speaker handles a respectable 100 watts of continuous program power, so you can get a little volume when you need to. And it's ready to shine on the patio as well, thanks to a weather-resistant design that incorporates a 3" fiberglass woofer and a 1/2" polyetherimide tweeter. The InvisiBall® mounting system lets you make a permanent, but flexible installation, allowing 37 degrees of movement in the vertical plane and 40 degrees of horizontal rotation. The cabinet and grille can be painted to match any decor. 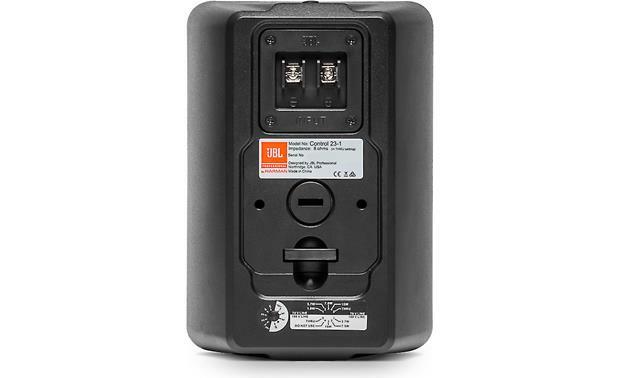 The JBL Control 23-1 offers tap settings at 1.8, 3.7, 7.5, and 15 watts. That means you can daisy-chain multiple speakers throughout your establishment, with a single wire run and just one or two amplifiers. That range of settings lets you vary the relative volume based on where the speaker is placed. Control Contractor Series Surface Mount Speaker: The Control 23-1 is a two-way surface-mount loudspeaker with rich sonic character, wide coverage, consistent coverage, versatile mounting, and a contemporary design that fits into a wide range of decors. This makes Control 23-1 an excellent choice for a wide variety of applications, including retail stores, restaurants, health clubs, theme parks, educational facilities, hospitality, music cafes, leisure venues, and anywhere where a top quality high-output indoor/ outdoor foreground/background music (and/or paging) speaker is required. Two-Way Speaker Design: The Control 23-1 indoor/outdoor speaker employs a 0.5" PEI horn-loaded tweeter and a 3" woven fiberglass cone woofer for high fidelity sound performance. The horn-loaded 0.5" tweeter features a PEI diaphragm, low-viscosity ferro-magnetic fluid, and a lightweight Kapton voice coil former. The 3" woven-fiberglass cone features a pure butyl rubber surround with Weather-Edge frame protection, high-temp fiberglass voice coil former, high-temp voice coil wire, optimized cone geometry, linear suspension spider, and FEA optimized motor structure. Its speaker design ensures excellent sound character, providing pleasant, enveloping sound throughout the listening area. 0.5" Tweeter: The horn-loaded 1" tweeter's low viscosity ferro-magnetic fluid increases voice coil cooling for higher long-term power handling. The PEI diaphragm delivers a smooth high frequency sound quality. A light weight Kapton voice coil former increases durability while providing better high frequency response extension. All these factors also contribute toward making the driver especially rugged for outdoor and other stressful applications. The Control 23-1's horn-loaded tweeter provides an even 100° x 100° coverage area to ensure excellent sound quality throughout the listening area. Weather Resistance Enclosure: In addition to the driver designs contributing toward a high degree of weather resistance, the cabinet provides excellent endurance against sun, salt and moisture. Weather resistance is maximized by the Control 23-1 speaker's high-impact polystyrene (HIPS) cabinet and heavily zinc-plated grille. The Control 23-1 is available in a black or white finish; the cabinet and grille also accepts a variety of paints to match any décor. 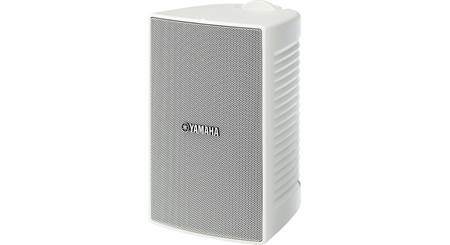 The Control 23-1 indoor/outdoor speaker is IP-44 rated and exceeds MilSpec 810 for humidity, salt-spray, temperature & UV. It also passes MilStd-202F for salt spray and ASTM G85 for acid-air plus salt spray. 70V/100V Compatible: Control 23-1 includes a 30W multi-tap transformer for use in either 70V or 100V distributed-line systems. Taps are selected with a rotary switch located on the rear-panel. Note: The Control 23-1 also features an 8-ohm pass-through setting. Screw-Down Terminals: Speaker wire connection is made via weather-capable, screw-down terminals. Mounting Options: The unique InvisiBall mounting hardware is included, making short work of permanent installation. The InvisiBall mounting method provides a high degree of both vertical and horizontal rotation. And, because InvisiBall adjustments are made through a hidden access behind the logo badge, the grille never needs to be removed and there exists a high degree of theft deterrence as well. Integrated M6 mounting points for an optional U-bracket adds to the installation versatility. 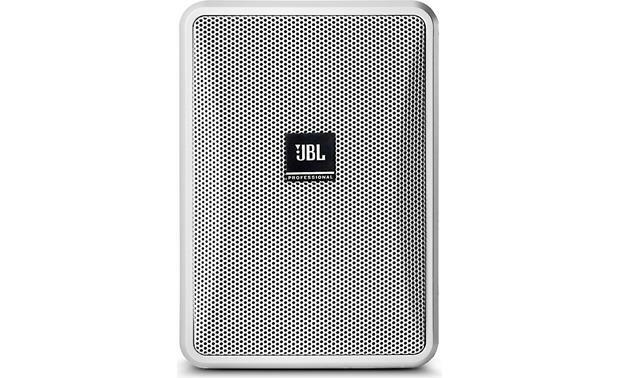 Searches related to the JBL Control® 23-1 3" commercial weather-resistant surface mount speaker.